Review of Rogue Hazelnut Brown Nectar | Beer Apprentice - Craft Beer News, Reviews, Interviews and Info. For tonight’s review I want to share with you a beer from one of my favorite brewers. 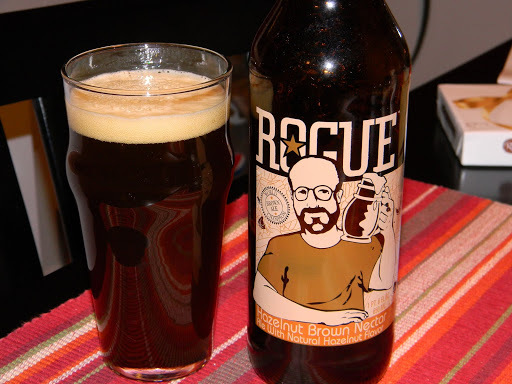 This beverage is made by the Rogue Brewing Company located in Newport, Oregon. An ale called the Rogue Hazelnut Brown Nectar. Some info on the brew from the company’s website, rogue.com. Dedicated to the homebrewer in each of us! The homebrewer who inspired this creation is Chris Studach, a friend of Rogue’s resident wizard John Maier, who added a Northwest twist to the classic style by adding hazelnuts for the host homebrew at the 1993 American Homebrewers Association convention. Chris put the nut in nut brown! This 22 oz. bottle steps up to the plate at 6.2% ABV. After the pour, the first thing I notice is a very, very nice amber/brown color with an off white head that was creamy and very full. It had more than adequate retention with some very nice lacing to follow. The beer is somewhat hazy with orange highlights around the bottom and sides of the glass. The aroma revealed a tremendous roasted hazelnut that was deep and toasty. A awesome fragrance of a woody almond and walnut mixed with traces of caramel that add a touch of sweetness to the nose. I almost detect a brown sugar with hints of butter. This brew smells wonderful!!! Perfectly balanced and beautifully put together. The taste brought out unquestionable full flavors of a roasted, toasted hazelnut and walnut. Some suggestions of bitterness, but nothing intimidating or distracting. Similar to the smell, I picked out the caramel and subdued butter samplings. The further I dug into the flavor, I started to recognize a very faint chocolate accompanied by a slight warmth, but no real trace of alcohol. Very nice and properly attuned. The mouthfeel was a solid medium. It was smooth, slick and crisp. Befitting amounts of flavor were left on the palate, but not an overabundance. It was sure enough comfortable and dry throughout the entire experience. This is a pleasing and correct brown ale. Not extremely filling, which makes it easy to drink so that it could be enjoyed year round. Wonderful aroma and flavor. I kept sniffing it because it smelled so, so good!!! This “Brown’s” aroma, in my opinion, is the example that all others should be compared to. It was more than adequate in all the remaining categories, but the fragrance is the star of the show here. Without a doubt, a beer that I will surely pick up again in the near future. Please, if you have tried this, leave a comment. I would love to know what you thought of it.